This photo does not do justice to SuperK’s seafood gumbo. It tastes even better the next day. I’ve always been a huge fan of leftovers. In our family, groceries are our second-largest expense, so as The Frug, I am always going out of my way to make sure nothing goes to waste unless it’s absolutely necessary (mold growing on it, stinks, slimy to touch etc.). The average family of four in the US spends about $1025 a month on groceries. In urban areas, like the DC Metro area, this number is closer to $1250. My wife SuperK tells me our grocery bill is even higher due to the fact that we eat lots of Meat, Seafood and other high protein delicacies. 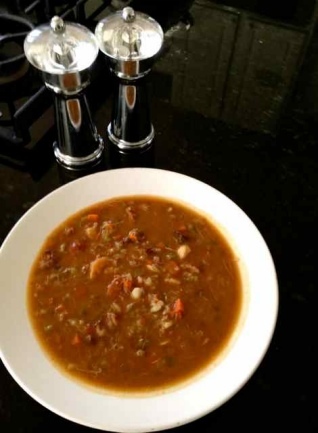 So, it’s a bit of a conundrum to be a Frug and still really enjoy giant lumps of crabmeat floating in your gumbo! One way we like to deal with this is maximizing the leftovers. Years ago, I came across the website http://www.feedthepig.org/. It has links to some simple calculators and ideas to put your savings in high gear by skipping all kinds of things, including expensive lattes, $13 lunches and premium cable plans. Feed the Pig also lists all types of expense slashing ideas (by habit) to help you reach your savings goals. Replacing some lunches out with leftovers is a great way to do this. One big advantage of working from home, or an office with a nice fridge, is the ability to really tap into the leftovers and skip a few lunches out a week. You’ll also find that, if you do it right, most of the leftovers will be a lot healthier than what you might find at that gourmet burger joint or KFC. 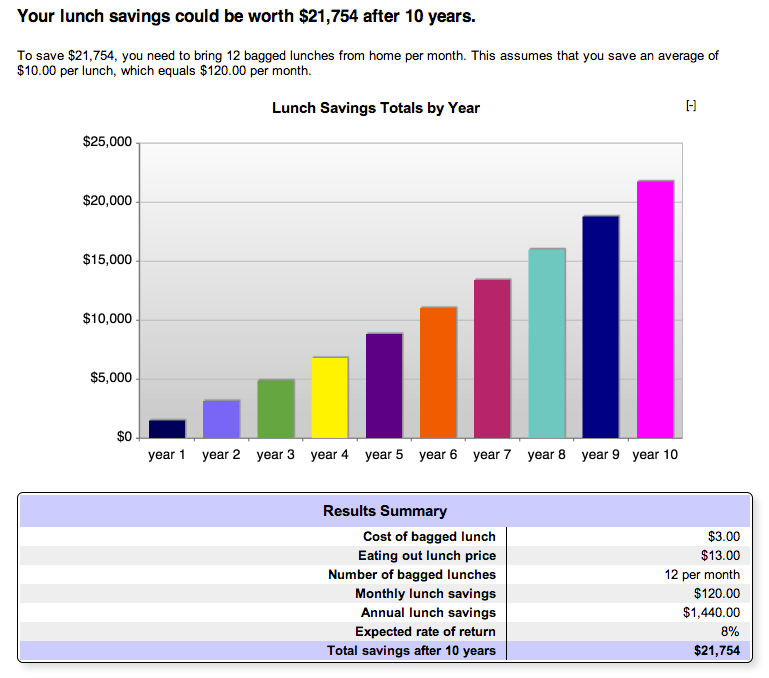 Here’s a quick look at some results from the lunch calculator. Notice I still eat out once or twice a week. The key message here, is that you start to apply these frugal tools to other expenses in life, like a latte-a-day habit or shoe addictions, you can really start to see results. As you get closer to financial independence, you’ll find that you’ve applied this type of thinking to many parts of your daily life and have started putting those dollars to work for you. Keep in mind every dollar that you save and invest will continue to work for you and produce returns year after year long after you’ve stopped working for a paycheck.